This Tuesday evening found me on the rooftop patio of Pauper’s Pub having a pint with Mark Lavorato and company. Mark was reading that night at ArtBar, the longest running poetry-only series in Canada, and I had been charged with hand delivering the books to the event. You see, Mark is a Montreal resident and had come into Toronto on the train that day. In fact, Mark had come in that very evening, and had come straight to the bar from the train station. There was no chance of him picking up the books along the way, so I was given the delightful task of carrying them from my quiet suburban home on the fringes of the city down to the pub on Bloor Street. We had a nice ride down on the subway together, me and the ten copies of Wayworn Wooden Floors. 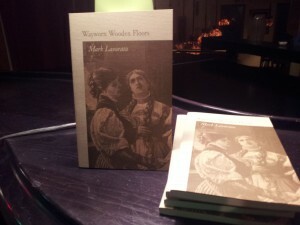 Mark launched Wayworn Wooden Floors in Montreal and Toronto back in June. You can read about our lovely launch party at Nicholas Hoare Books here. Since then, he has been promoting the book, with readings booked in Toronto, Ottawa, and Hamilton. The reading at ArtBar was a huge success, with two fans even coming over to give Mark hugs afterward. As we came downstairs for the reading, retreating from the patio just as the temperature began to drop and the wind picked up, I saw that the event would be taking place in the cosy second floor bar of Pauper’s Pub. Big booths with red cushioned benches lined the walls and a large bar jutted out into the room. We settled in at the back as the ArtBar coordinators set up the stage. Wayworn Wooden Floors at Pauper's Pub. The first reading, much to our surprise, was given by PQL’s very own Shane Neilson. Shane read from Complete Physical as well as a few of his other published works. He even read a few unpublished poems for us, which was a real treat. He focused on mental illness, reading poems that spoke to that theme, so the experience was very interesting. I had the pleasure of speaking with Shane after his reading and thumbing through his poetry collections. Complete Physical, he says, is one of his most popular collections since the subject matter is so interesting. Often patients wonder what their doctors are thinking…. Well, in Complete Physical Shane lets us in on the secret. After Shane, Ned McFarlane read, and following Ned was Mark. Mark delivered an excellent performance, taking time before each poem to explain its genesis. He also, in jest, had offered to read some new poems his friends and I hadn’t heard yet, so he mixed up his usual routine by reading “True Patriot Love,” a poem that examines the real meaning of nationalism in today’s global society. Does nationalism still have relevance when our genes are so intermingled? And when nationality ceases to have meaning on a biological level, how is it used? Following the reading, the floor was opened up to the crowd. Audience members were encouraged to sign up for the open mic. We had any interesting selection of poetry from all different types, including a delightful poem about the differences between animals and humans. All in all, it was a great way to spend a Tuesday evening in the city. I got to have a few pints with some great folks, listen to some incredible poetry, and even meet a new PQL author, Shane Neilson. 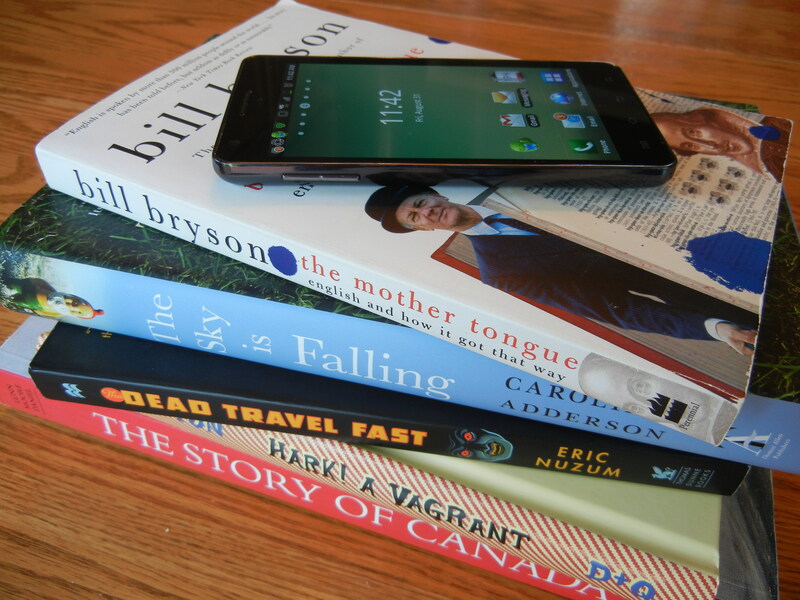 I also learned that reading poetry off our your smartphone is now a thing! Will wonders never cease! Until next time … Porcupette out!